Rapidly design and deploy scalable workflows that automate complex IT processes. 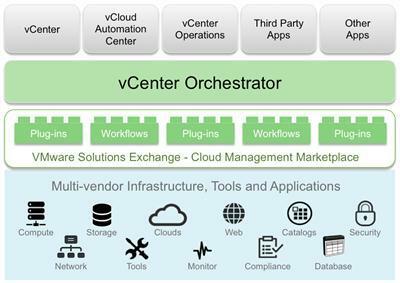 Leverage vCO workflows and plug-ins to extend the capabilities of VMware vCloud Suite and the vSphere platform. The cloud management marketplace on VMware Solution Exchange provides a library of VMware and partner-provided vCO workflows and plug-ins. Create your own types to use in workflows, without having to wait for a plug-in update or creating a new plug-in. Generic plug-ins allow you to automatically create workflows based on SOAP, REST operations and PowerShell scripts. Automate the delivery of new IT services or adapt the capabilities of existing VCloud Automation Center infrastructure and application services by invoking VCO workflows and plug-ins.